Helsinki University of Technology (TKK) (Finnish: Teknillinen korkeakoulu; Swedish: Tekniska högskolan) is the premier technical university in Finland. It is located in Otaniemi, Espoo in the area of Greater Helsinki. Helsinki University of Technology was founded in 1849 and received university status in 1908. It moved from Helsinki to Otaniemi campus area in 1966. The university has 246 professors and approximately 15,000 students in four faculties and 19 degree programmes. The TKK offers the following degrees: tekniikan kandidaatti (Bachelor of Science (Eng. or Arch.) diplomi-insinööri (Master of Science (Eng. ), arkkitehti (Master of Science (Arch. ), maisema-arkkitehti (Master of Science (Landscape Arch. ), tekniikan lisensiaatti, tekniikan tohtori (Doctor of Science (Tech. or Arch.) and filosofian tohtori (Doctor of Philosophy.However, the bachelor's degree is considered only an intermediate step and all students are accepted to study both the bachelor's and master's degrees. TKK is known, among other things, for its Low Temperature Lab, which has set the world record for the lowest temperature, and has had several other notable scientific successes. TKK's mobile communications research and teaching is considered to be among the best in the world and TKK is also one of the leading universities in the world when it comes to the chemical technology involved in wood processing. The first commercialised total synthesis, the synthesis of camphor, was invented by Gustaf Komppa, the first professor of chemistry at TKK. Also, Nobel laureate Artturi Virtanen has held a position as professor at the chemistry department. Teuvo Kohonen, perhaps the most cited Finnish scientist and an inventor of many neural network algorithms, was a professor at TKK. The aim of TKK is to rank among the top ten universities of technology in Europe. 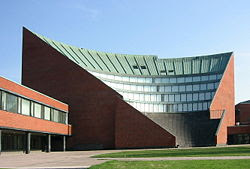 Much of the Otaniemi campus was designed by the world-renowned architect Alvar Aalto. In 1849, TKK was established in Helsinki by the Imperial decree of the Russian Emperor Nicholas I, Grand Duke of Finland as a "manufacture and handicraft school", with the name Helsingin teknillinen reaalikoulu, along with two other similar schools, situated in Vaasa and Turku. In 1872, the school's name was changed to Polyteknillinen koulu ("Polytechnical School") and in 1878, to Polyteknillinen opisto ("Polytechnical Institute"), while the two other manufacture and handiwork schools were demoted to institutions of lower level. As the proportion of matriculation diploma holders in the student intake gradually increased, the school gained more social respectability. In 1908, TKK was given university status along with its present name, thus becoming the second university to be founded in Finland. In 1955, building of the new campus area started with the housing village. In 1966, TKK moved from Helsinki to the new campus in Otaniemi, Espoo. TKK was also known under the abbreviations HUT and TH from its English language and Swedish language names, but in 2005 a decision was made to officially solely use the abbreviation TKK for branding reasons. In 2005, Bologna process was implemented and in 2008, the organizational structure was changed. There is a plan to merge TKK, Helsinki School of Economics and University of Art and Design Helsinki, although these schools would remain as sub-units of the new Aalto University. Nearly all programmes lead to the degree of diplomi-insinööri ("engineer with university diploma"), a Master's level degree taking six years to complete (as a median). The only exceptions to this are the architecture programmes that lead to the Master's level degrees of an architect or a landscape architect. From 2005, according to the Bologna process, all students must also complete an intermediate degree (tekniikan kandidaatti, TkK) before the DI or architect degree. This degree is considered a Bachelor's degree and enables enrollment in foreign universities where a Bachelor degree is required. TKK does not offer Bachelor-level only programs; a student may only be accepted to study for the Master's level degree. TKK requires a Bachelor's degree from foreign students studying in English, because only Master's studies are completely in English.